In class tonight, my students did a very nice job putting together a tasty Indian dinner. I brought frozen paratha breads, which the class had to briefly pan heat, some of my Mom's homemade lemon pickle, and spicy snacks for them to nibble on as they cooked. They cooked a nice rice pilaf (sorry that I forgot to get cashews for them to toast and mix in to the pilaf), curried mushrooms, bhindi (okra), and a tomato salad that was a favorite of my Nanaji's (maternal Grandfather). They also made chai with rice and hazelnut milk, mango shakes, and chocolate tofu pies with organic cherry preserves. So far in this series of six classes, the consensus is that the Italian cooking class was the best, though one or two of my six students said that tonight was. Surprisingly, some did not like the pie tonight; it is usually a big hit. Everybody liked all of the main courses and drinks! 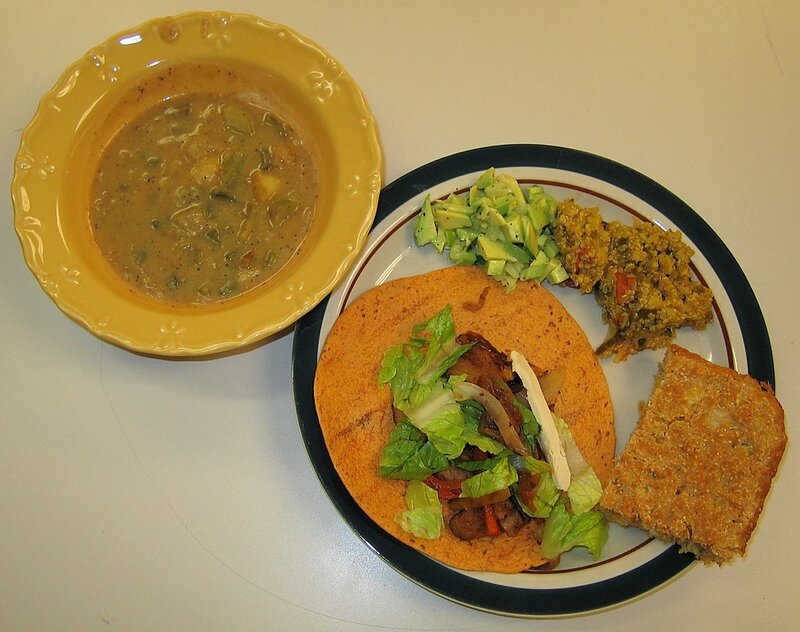 What a great Thanksgiving we (Triangle Vegetarian Society) had on Thursday! 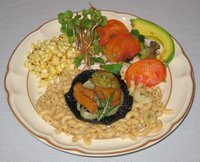 It seems for the third year in a row we had the country's largest vegetarian (in fact all plant-based vegan!) Thanksgiving dinner with close to 400 diners. Today meal preparation was easy - it was mainly just reheating leftovers from Chef Robert Adams of Durham's Café Parizäde, where we hold our Thanksgiving. What I brought home and served as leftovers today were a wild mushroom and French green lentil risotto with seared tempeh (very good); organic conchiglie pasta with vegan Bolognese sauce (came out great! I prefer the larger conchiglie pasta that I use, but this was also very good - and Robert's sauce was chunkily delicious); lime-marinated seared seitan with peppercorns and fig glaze (wow! my recipe - Robert made this the best dish of the feast); and cornbread. I also sliced a little bit of vegan mozzarella "Sheese" and when my appetite demanded more, also made a grilled "Sheese" sandwich. "Sheese"! Originally called "Scheese", I discovered this when I was in London in January and quickly dubbed it my favorite vegan cheese. I contacted the Scottish manufacturer, Bute Island Foods, asking if I could help them bring their product to the U.S. Shortly before Thanksgiving, they contacted me to let me know that they had started a relationship with a domestic distributor, Black Duck Imports!! They sent me samples to arrive in time to be part of our Thanksgiving raffle so that I could promote them, and I was able to keep to try blue, cheshire, edam, cheddar with chives, and mozzarella flavors. The mozzarella is good and melts reasonably well, but not as good as the cheddar or cheddar with chives. I can't wait to try the other flavors! Thanksgiving! You can peek at the menu on our Thanksgiving site - it included over 25-30 items, many of which don't even appear on the menu! We left to take my aunt and parents to the Blue Ridge Mountains on Friday for the weekend. On Friday, we ate at one of our favorite restaurants, the Laughing Seed Café in Asheville. On Saturday, friends of ours (whose wedding we had attended in September) had us all over to their home for a lovely vegan dinner of many items including butternut squash soup; spaghetti squash with "cheese and sausage" sauce; sweet potatoes; greens; and a nice tempeh dish with Indian spices. 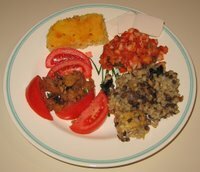 I was excited that my Mom enjoyed the food, including the tempeh; my Mom is very particular and doesn't readily stray from her own cooking, but now I know a hook to get my Mom to try my tempeh - make it with Indian spices. Yesterday, we ate at the very nice buffet at Earth Fare - the Asheville stores are much better than their local ones. Tonight, I cut some Brussels sprouts in half and marinated them in Drew's Thai Sesame Lime dressing /marinade then sauteed them with a little shallot. 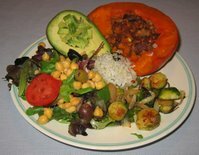 I heated the squash stuffed with scrambled tempeh that I had made last week and some rice with lentils that we had left from the South Indian restaurant last Thursday. 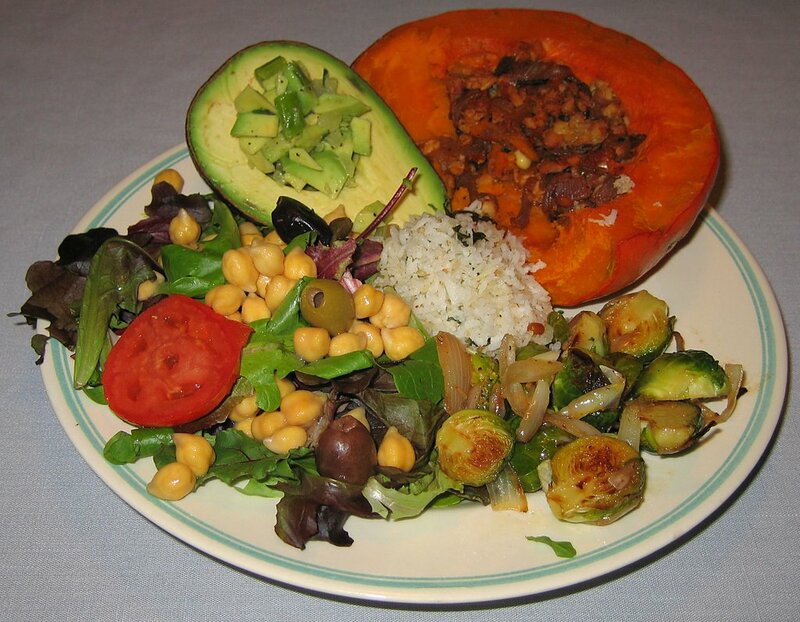 A salad and avocado, stuffed with the avocado salad from last night, rounded out the meal. 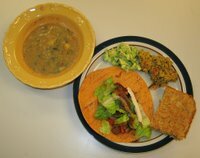 In today's cooking class, my students prepared seitan-based fajitas, avocado salad (it was supposed to be guacamole, but the avocados were not ripe enough), quinoa with leeks, cornbread, potato soup and, not shown here, dessert - "Dilip's Orangey Rice Pudding" and mango. Yesterday, my Mom had us over to her home to celebrate Bhai Dooj, a holiday where sisters honor their brothers and brothers give them their blessings. My aunt, visiting from Connecticut, played the role of sister, as well as representing her daughter, my cousin. After the short ceremony, my Mom served an Indian dinner. An aunt from Connecticut arrived today for a week and a half or so visit. After picking her up from the airport and going for a hike, I got to work on dinner. I cut some small white potatoes into quarters and thirds, depending on size, and tossed with some olive oil, salt, freshly ground black pepper, and chopped rosemary needles from my garden. I baked the potatoes at 400° F for about a half hour till they just started to brown. In the meantime, I cut some delicata squash into halves, removed the seeds, and baked them, cut side down on plates with a little water in them, for a little less time (I could have baked them at 350° or so). I prepared a sauce as well - I put into a bowl Earth Balance non-hydrogenated margarine, salt, paprika, and Volcano Lime Burst (water, organic lime juice, lemon oil), and put the bowl into the oven for a few minutes till the margarine melted. 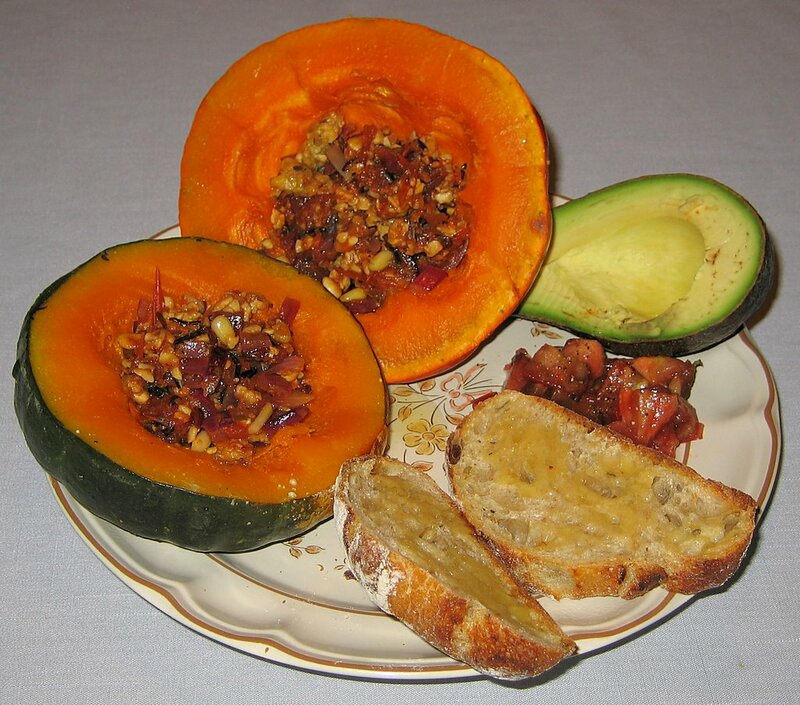 When the squash was soft, I served it with a generous coating of the sauce and some pomegranate kernels. I also sauteed tempeh. When it was nearing completion and getting nicely browned, I added some red bell pepper for a few minutes, and put a few drops of hot sauce and Colgin Liquid Smoke on each piece of tempeh. Lemon sourdough boule, lightly toasted, and heirloom tomato rounded out the meal. I was planning a nice dinner last night, but we went to a pottery festival a few hours away and it became fairly late, so we decided to eat out. We chose Queen of Sheba's Ethiopian Restaurant in Chapel Hill. We had a good dinner (and ran into a number of folks we know) of a mixed vegetarian platter and would have picked up a raffle prize for Thanksgiving but the owner had just mailed it. But the discovery I am so happy to have made is an appetizer that is like hummus but much more garlicky and creamier. It is made with chickpeas and lots of garlic; I don't know what makes it so creamy, but the waiter assured us it is vegan. We loved it! Though I love to cook, I'm starting to think that going out, even when we don't "have to", is also a joy. I am anxious to purchase and have more organic Conchiglie (seashell) pasta that I first made in mid-September from this fabulous company in Marche, Italia, or other varieties of their pasta. Surprisingly, as I mentioned last Friday, the farfalle I brought back from Italia is decent but not noteworthy, and today I used up what I had left (though I do have another bag of this type of pasta, but made with chocolate and wheat!). Our first host in Italia, a kind man named Ambrogio, illustrated a way of integrating onion into sauces that I hadn't tried. He takes a small pan, puts oil in it, and heats up onion, cooking it, covered, over low heat for sometime (maybe 15-20 minutes), till the onion is nicely softened. I did something like this, but using shallots widely sliced. I served the pasta simply with the softened onion and oil, topped with a little Parma! 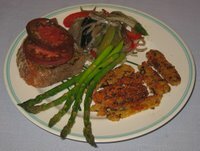 vegan "parmesan cheese", and next to grilled apple-sage artisanal vegan Field Roast Grain Meat Company sausage. It was a reasonable dinner. Yesterday I taught in Carrboro (west of where we live) and my wife gave a sitar performance in Raleigh (east; it was too bad that it was coincident, precluding my enjoying her playing! ), so we met somewhere in the middle to eat at one of our favorite restaurants, Tower South Indian Restaurant in Morrisville. After appetizers, my wife had a rice dish and I had spring masala dosa; both were leftover, and I will probably heat them and serve them with a side dish in the coming days, unless we enjoy them as mid-day snacks. By the way, Thanksgiving reservations are over 300 now; I am expecting 400-425. Check out the map showing where folks are coming from! Tonight, I prepared seasonal fare by using two kinds of organic winter squash, Ambercup (deep orange and looking like a small pumpkin) and turban-shaped Buttercup. I think this was the first time that I have had Ambercup - the better cooked and drier outside portions reminded me of the taste of chestnut. I simply cut the squashes in half, removed the seeds, and baked, face down on a dish with a little bit of water (to cook with steam and keep the squash moist), at 375° for about 35-45 minutes till I could poke through the flesh with a knife with slight resistance. In the meantime, I prepared tempeh in a somewhat unusual way. My wife often finds squash bland for her taste (I, on the other hand, love it with just some vegan margarine and salt), so I sauteed tempeh and red onion, crumbled the tempeh, and mixed in some spices and salsa. 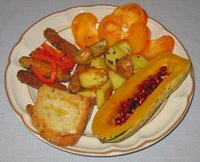 I served the squash halves with the scrambled tempeh inside, and we both enjoyed it - I especially liked the Ambercup. A great loaf of rustic garlic bread, gently toasted, heirloom tomato, and avocado rounded out the meal. Tonight was Italian cooking class, and my students made an eggplant saute, rainbow orzo with lemon juice, bread salad (panzanella), and polenta. Not shown is dessert; that was a delicious blueberry crisp. I thought that I would also add an interesting video below that just got published, describing the source and cost of meat. Today I wanted to use up the leftover noodles from last week. 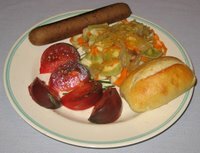 I also sauteed some tempeh and served it with some paprika and other spices. 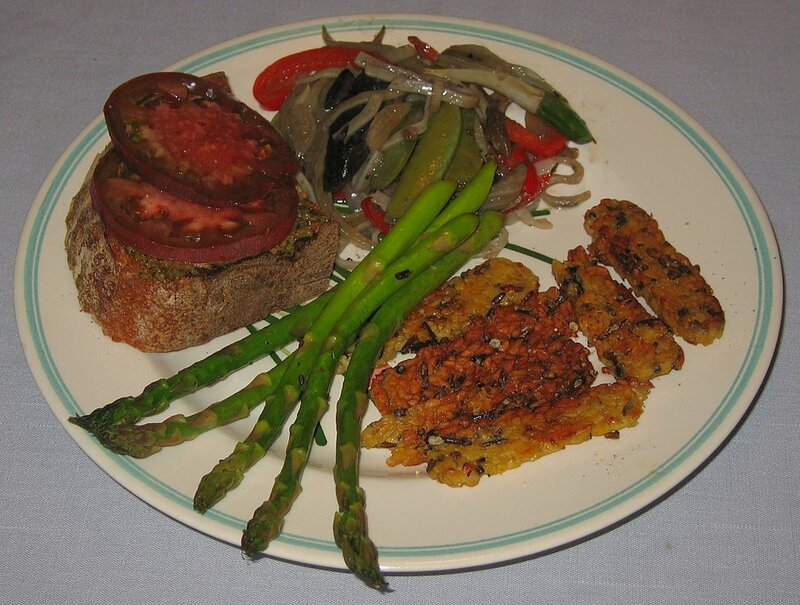 I grilled asparagus spears and toasted some sourdough bread, topping it with my homemade pesto and slices of tomato. Last night I was planning this dinner, but we had almost no time after a cultural art walk and before a film I was going to see, so we stopped at Whole Foods and had dinner there. 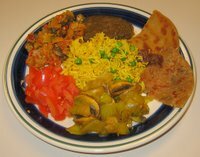 We went to a play with some friends on Saturday night, and they prepared a good Indian dinner for us. On October 27, I made a delicious batch of pesto and today used it in another pasta dish. I brought some bow-tie pasta (farfalle) colored with cayenne pepper and spinach back from Siena in Italia; I think this must have been oriented toward tourists as the pasta turned out to be rather unremarkable. Anyway, I served it with Nate's Savory Mushroom vegan "meatballs" and some pesto. 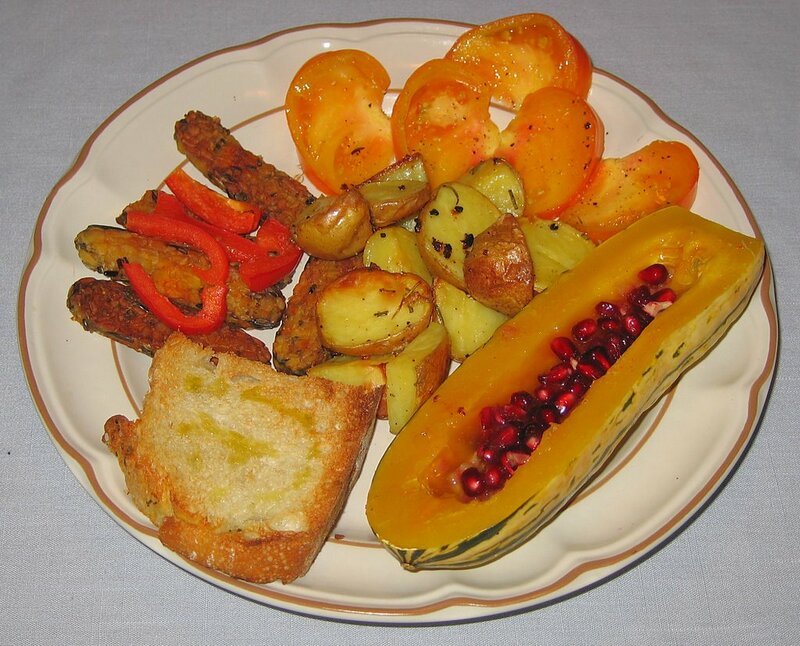 I also served crostinis with roma tomato and pesto, and grilled vegetables. My wife and I both enjoyed the meal. Yesterday after a photography class that I taught, we visited Vespa Ristorante in Chapel Hill. 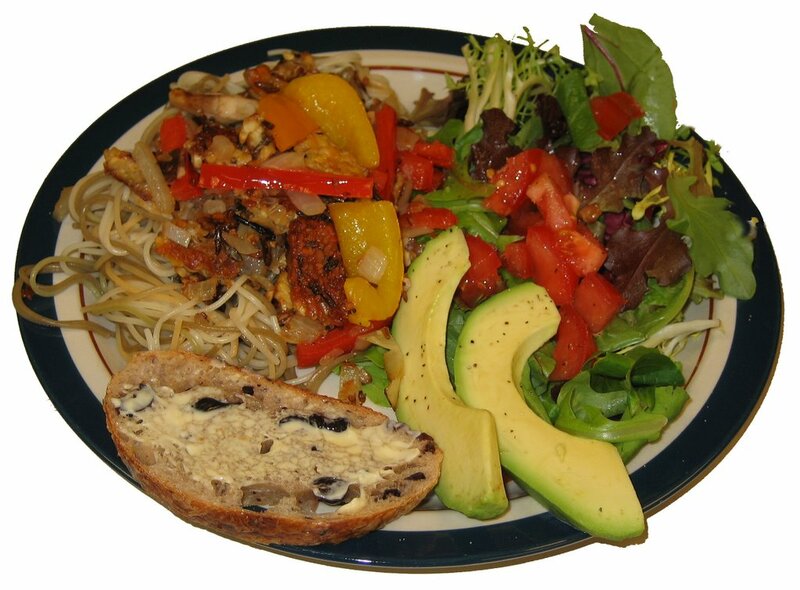 New owners are transitioning to a new menu, and one of the owners seemed quite interested in my veganism, cooking instruction, and the group that I lead, Triangle Vegetarian Society. We may meet next week for him to solicit ideas from me about his menu. We let them bring out what they wished; we had salad, then a plate of grilled polenta and grilled vegetables - including perhaps the most tasty grilled zuchinni I've had. The dinner was decent but not so filling. By the way, we're up to over 200 people reserved for this year's Thanksgiving! I've been fairly busy with getting this event together, including contacting companies to be part of our raffle. I had some leftovers that I wanted to finish, including coconut milk used to make the Thai tempeh and vegetable dish that I made on Saturday for a potluck dinner and broccoli di Cicco with shredded potato and shallot from last week. I served the little that was left of those two dishes, and also made a new dish with the coconut milk. I first marinated thickly sliced portabello mushrooms in Drew's Thai Sesame Lime dressing /marinade then started sauteeing in sesame oil the drained pieces. It was a quick saute (mushrooms, of course, contract as the water is cooked away), and I added in quick succession half-moon sliced onions, diced shallots, and sliced bell pepper and ginger. After a few minutes, I added the little bit of coconut milk that I had left, as well Caribbean hot sauce, a little salt, and peas in pods. Warmup Cooking Class: "3 a.m. Pasta with Tempeh"
Tonight, I taught the first of six Tuesday nights (through December 12) of vegan cooking. The plate here shows the work of my students - today was mostly lecture, and they had about 30-45 minutes to quickly put this meal together. As I mentioned back in July when I last taught this class, the pasta is named after a friend who would show up sometimes at 3 a.m. - "what do you do when a hungry friend shows up at your home at 3 a.m.?" 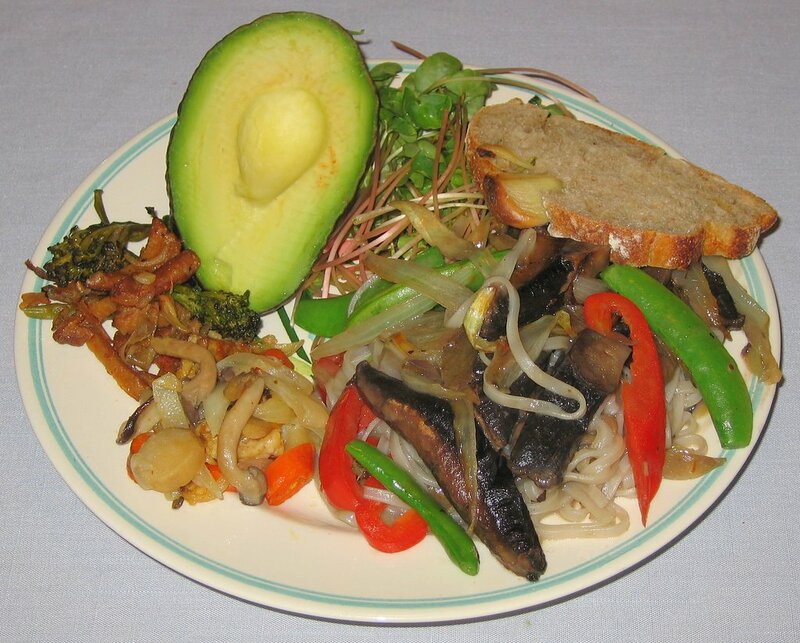 This is a simple but filling and tasty dinner. It is a quick saute of tempeh, shiitake mushrooms, onions, and shallots. It is served on top of pasta and along with warmed bread or toast and salad. Tonight I was thinking of making pesto pasta, but noticed that I had enough leftover whole wheat noodles from Thursday night, that I should finish them up. I made a simple dinner with some of my pesto that I recently made atop the warmed macaroni. When we were in Toscano, we had a splendid lemoned string bean dish. I found very nice Heirloom French beans at the local farmer's market - but last Saturday, and they were getting dehyrdrated. I tried my hand at gently sauteeing them in lemon olive oil then serving them with lime juice and salt, but need to try this again with fresher beans. I picked up a loaf of lemon sourdough boule today and served it with a vegan margarine. 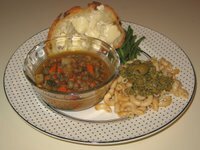 Finally, as part of this simple dinner, I heated a can of Amy's organic vegetable lentil soup. Yesterday, we attended a fun potluck dinner with at least 30 attendees; I made a Thai tempeh and vegetable dish in coconut milk. On Friday, I was looking forward to preparing a second dinner for our Taiwanese guest (who left later that evening), but had a meeting at Café Parizäde to put this year's Thanksgiving menu together (reservations opened up around 5p yesterday and today we're already up to just shy of 100 reservations!) that lasted several hours. As we were getting ready to leave, the chef offered to send us home with dinner - we enjoyed his yummy squash-spinach risotto and crusty breads, and I simply made a salad. This afternoon, we had the privilege of hosting a Servas traveler visiting us from Taiwan; this young man is interviewing at some excellent schools (like Duke University here in Durham, NC) for MBA programs. He came with me to a photo workshop that I taught, then came home in the evening. For him, my wife, and myself, I grilled portabello mushroom caps, seitan, and onions. 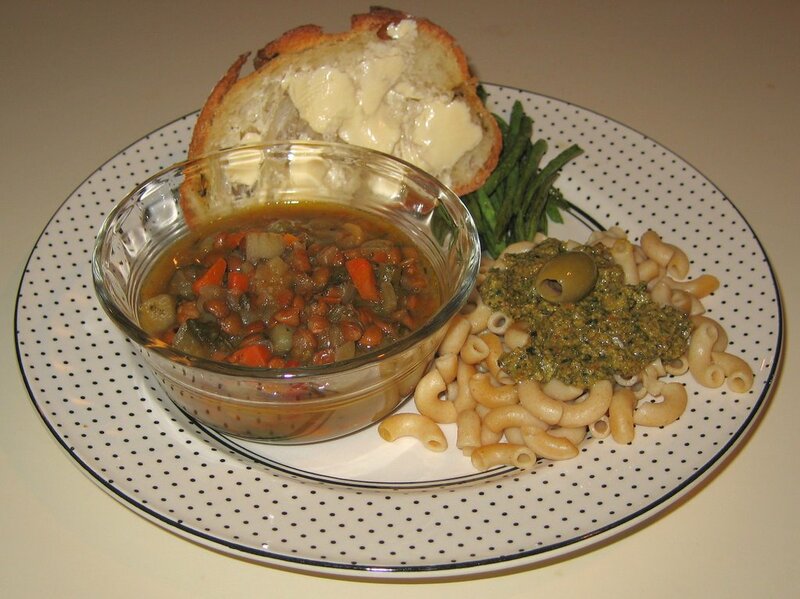 I served these atop whole wheat macaroni, with a small dollop of pesto. I also grilled corn and made a salad, including buckwheat lettuce, something I've not known about before. Sprouted buckwheat, I found it in the store today - it tasted good and, according to the carton, is fairly nutritive. I thought that dinner was good, but couldn't believe the praise that our visitor heaped on it. He claimed that this was the best meal he had ever had in the United States - and he has visited a number of times. I'm glad that he enjoyed it!